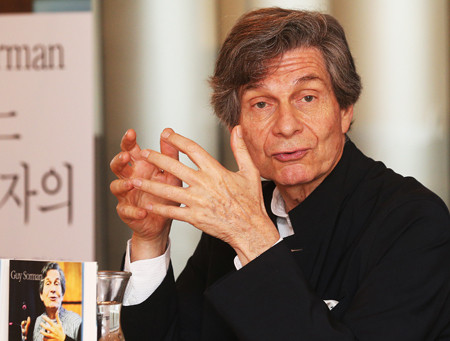 The public policy on promoting Korean culture abroad needs a systematic upheaval to enhance coherence and efficiency, said a French intellectual and a global advisor to President Lee Myung-bak. The reason his critical comments carry such significance is because he has been in communication with the presidential office for years, including directly with President Lee. In 2009 together with 11 other scholars, Sorman was chosen as a global advisor to the President. Lee isn’t the only head of state. The author met with late Presidents Kim Dae-jung and Roh Moo-hyun on previous visits to Seoul. He also criticized the work of the Korean Cultural Center in Paris, where he resides. In recent years, film and soap operas produced in Korea and Korean pop idol bands known as K-pop attracted fans abroad, prompting the government to subsidize their projects and events. Yet, critics argue the positive feedback is heavily self-professed and blown out of proportion by the government as well. He acknowledged the level of success achieved by Korean cinema or K-pop singers, and attributed the success to the artists themselves. Just last week, “Pieta” by director Kim Ki-duk won the Golden Lion at the 69th Venice International Film Festival, giving a boost to Korean cinema. Sorman praised his favorite Korean film “Hahaha” by Hong Sang-soo and Korean cinema for keeping its identity despite the dominance of Hollywood. “Korean cinema is very successful. It’s widely known, especially in France. I think it can survive without public support.” He encouraged film producers to take an aggressive approach so that Korean films can be screened on TV outside the country. About K-pop, the scholar refused to categorize it as Korean culture. Sorman reiterated one message: Find treasure in your own tradition. “Artifacts in Gyeongbok Palace, for example, are magnificent, but are not known outside Korea,” he said, and that’s where the public money should be spent on. He’s been visiting Korea on a regular basis for a couple of decades now, and occasionally writes about Korea and Korean society.